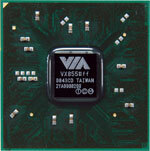 VIA Technologies, Inc, a leading innovator of power efficient x86 processor platforms, today announced the VIA VX855 Media System Processor (MSP) – an ultra power efficient, all-in-one chipset that addresses the key performance and entertainment requirements of today’s small form factor and mobile PC systems. Increasingly, content is being filmed in high-definition (HD), with movies, TV shows and sporting events taking advantage of the smooth playback, extraordinary picture clarity, and brilliant colors that HD video offers. However, until now the high bit-rates associated with quality HD video have posed a real challenge to the processing capabilities of power efficient PC systems such as those found in small form factor and mobile devices. Set to be Microsoft® Windows® 7-ready, the VIA VX855 MSP solves the problem by offering support for full hardware acceleration of the widest variety of leading video standards including H.264, MPEG-2/4, VC-1 and WMV9, greatly reducing the workload and thus the power consumption of the processor. Compatible with the ultra compact VIA Nano™, VIA C7® and VIA Eden™ processor families, the VIA VX855 MSP integrates all the cutting-edge features of a modern chipset’s North and South bridges into a 27mm x 27mm single chip package that saves over 46% of silicon real estate compared with competing twin-chip core logic implementations. This miniaturization, combined with extensive power management technologies and the ability to run fanlessly within a tiny 2.3 watt power envelope, enables system builders to design ever smaller, lighter, and more portable systems. 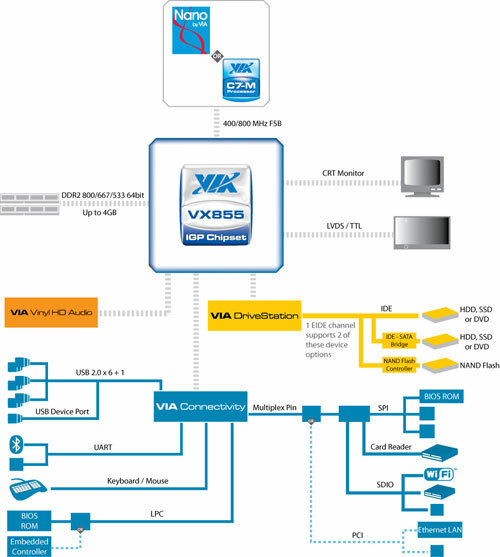 The VIA VX855 MSP integrates a high performance DDR2 memory controller, a 400/800MHz FSB processor interface, and extensive I/O capabilities (such as 6 x USB 2.0, SDIO, UART, SPI, LPC and SMBus) in a single chip. Support for the integrated VIA Chrome9™ HCM Graphics Processor, HD audio controller, and a host of display interfaces in its in-built LVDS transmitter, CMOS LCD and CRT interfaces, allows for more flexible multimedia playback options. An advanced graphics experience is powered by a high frequency 2D/3D graphic engine, while the high performance image processing features include support for hardware decode acceleration of leading video standards as well as up to three audio streams of up to eight channels each, with 32-bit sample depth and sample rates up to 192kHz.